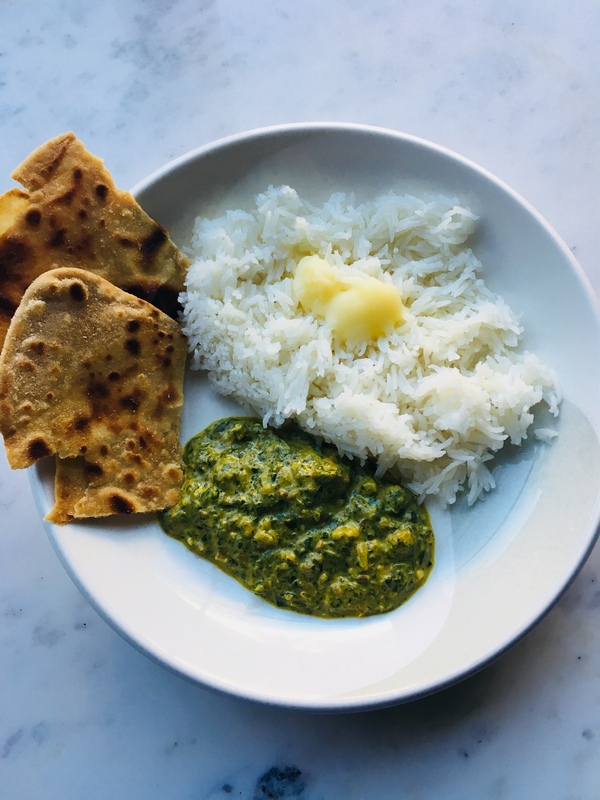 Raise your hand if you’re a momma who’s always trying to get more veggies into your kids….I know I am and recently, this creamy palak (spinach) dish did just that. With only about five ingredients (three veggies – spinach, tomatoes and onions), you probably already have what you need to whip this up in like no time! It is easy to make, tasty and pairs well with some fresh organic, Basmati rice and naan. For us, it was a complete meal with some papad and a cut of lemon on the side, but it can also serve as a side dish to a bigger meal. I have to admit, my younger one was not into it. He is still my raw veggie guy. If you give him some hummus with a plate of cucumbers and carrots, he is like the.happiest.kid.EVER. But my older boy, he has his mom’s palate and is always in the kitchen asking me what I’m cooking and what smells so “flavorful?! !” which is his new favorite way to describe foods he likes! I just love that he loves to explore foods and he was quite pleased (as his thumbs up shows!!) with this creamy palak (spinach) dish. So if you’re looking a fast, FLAVORFUL meal…try it out. PS+ Just double the recipe if you’re looking to make this the main dish for your meal. If it’s a side for a family of like four or so, use the recipe below. PSS+ To make it less spicy, just omit the peppers and use half the portion of garam masala. a quick creamy palak dish that is so good with just rice and naan and a little lemon! kids will love it too but just leave out the chili pepper and red pepper and adjust the garam masala. if it gets too spicy, just add in more cream.